The Ban Khrua neighborhood in Bangkok, once famous for its many shophouses specializing in hand-made silk, has seen many such operations close in recent years due to urban expansion and pollution of the canal running through the area. 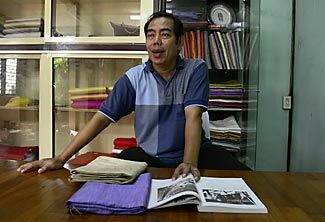 Nipon Manuthas is the proprietor of one of the remaining silk weaving operations in Ban Khrua, and his products are in high demand among wealthy Europeans. Ban Khrua was founded by Cham Muslims from Vietnam and Cambodia who were given a plot of land east of Bangkok as a reward for fighting on the side of the Thai monarchy in the late 18th century.